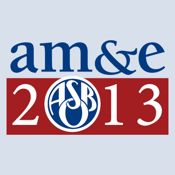 ASBO Intl 13 is the official interactive mobile app for the ASBO International's 2013 Annual Meeting & Expo. * Check-in to sessions, meetings, and exhibitor booths. The ASBOIntl 13 app was created by DoubleDutch, the leading provider of branded mobile applications for events, conferences and trade shows worldwide. The DoubleDutch platform is designed to thrill attendees and empower event organizers with powerful analytics. Create engaging, memorable events and conferences with a DoubleDutch mobile app today.